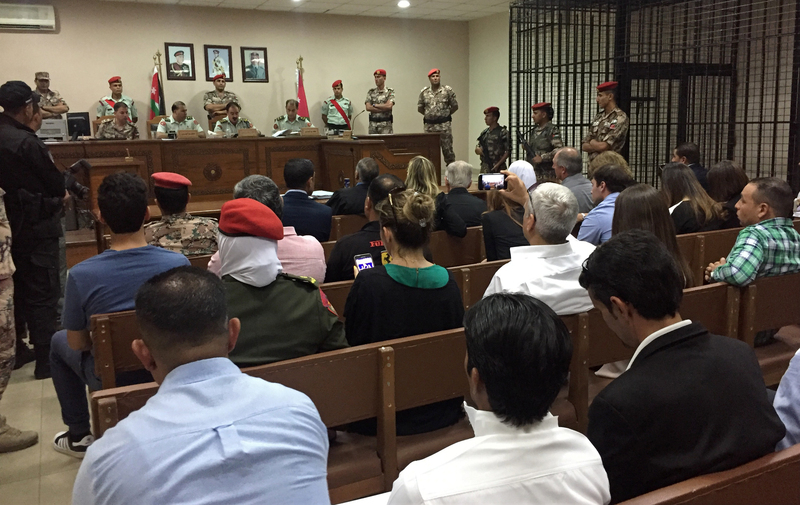 AMMAN, Jordan (AP) — A military court convicted a Jordanian soldier Monday of killing three U.S. military trainers at a Jordanian air base and sentenced him to life in prison with hard labor. The defendant, who had pleaded “not guilty,” has said he opened fire because he feared the base was coming under attack. Relatives of two of the slain soldiers sat quietly as the judge announced his ruling to a crowded court. Some of the relatives criticized Jordan’s handling of the case and called for the death penalty, saying the maximum sentence in this case, life in prison, was not enough. The three U.S. Army Green Berets were killed Nov. 4, as their convoy waited at the gate to the al-Jafr base in southern Jordan. Jordan initially said the Americans triggered the shooting by disobeying entry rules, a claim that was later withdrawn. The victims were 27-year-old Staff Sgt. Matthew C. Lewellen of Kirksville, Missouri; 30-year-old Staff Sgt. Kevin J. McEnroe of Tucson, Arizona; and 27-year-old Staff Sgt. James F. Moriarty of Kerrville, Texas. Jordan is a member of a U.S.-led military coalition against Islamic State group extremists in neighboring Syria and Iraq. Jordan hosts troops, including trainers, from the U.S. and other countries as part of the anti-IS battle. The military court judge, Col. Mohammed al-Afeef, said at the start of the trial that the defendant had no known ties to militant groups. This left questions about a possible motive. The defendant and some of the gate guards testified that they heard what might have been a pistol shot coming from the direction of the U.S. convoy. The defendant said he opened fire because he feared the base was coming under attack. Other guards said they held their fire because they couldn’t determine the source of the sound. The defendant has said he had “no intention of killing anyone” and felt no resentment toward Americans. However, security camera footage of the incident, as described by the bereaved relatives, shows the shooting lasted for six minutes. The video was shown to the family by U.S. law enforcement, but has not been released to the public. Some of the relatives have questioned why the video was not screened during the trial and why the court did not ask a surviving U.S. soldier to testify, despite what they said was his willingness to do so. In the letter given to The AP, Moriarty, a Houston lawyer, listed several demands to Jordan. This included allowing the defendant to be re-interviewed by the FBI about his motive and releasing the security camera footage to the families. Moriarty said the video had been entered into evidence at the trial. Defense lawyer Subhi al-Mawas said he would appeal the court ruling. In Jordan, life in prison can mean 20 years, with time off for good behavior. Earlier this year, a Jordanian soldier who killed seven Israeli schoolgirls in a 1997 shooting rampage was released after 20 years.